June | 2013 | Mommy. Foodie. Athlete. This recipe is so quick and easy, that it would be silly to not give it a try. I am embarrassed to even claim that this is a “recipe”, but it is a delicious combination that you may not have thought to try. You could try to make your own salmon burgers, but why bother when Trader Joe’s makes them so deliciously and chock full of salmon?! For this recipe, I used their burgers, but feel free to experiment with your own or any other pre-made variety. After my WOD this morning, I knew that I needed to have a healthy and filling lunch before heading off to a graduation party where I will be faced with the temptation of many delicious Portuguese foods that don’t fit into my diet. I stopped by Trader Joe’s on my Vespa ride home and started roaming the aisles looking for options. 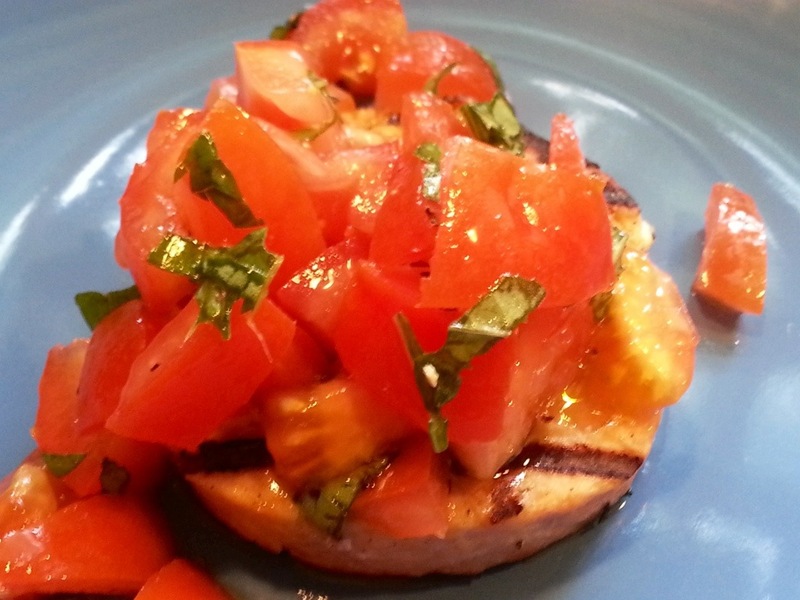 Their premium salmon burgers caught my eye, and after a little more browsing, I decided I would top it with bruschetta made from ripe tomatoes on the vine. 1. In a medium bowl, mix together all ingredients except salmon burgers. Refrigerate until ready to serve. 2. Grill salmon burgers according to package directions. 3. Top burgers with a mound of bruschetta, and enjoy a protein packed and satisfying lunch! This meal is scrumptious! 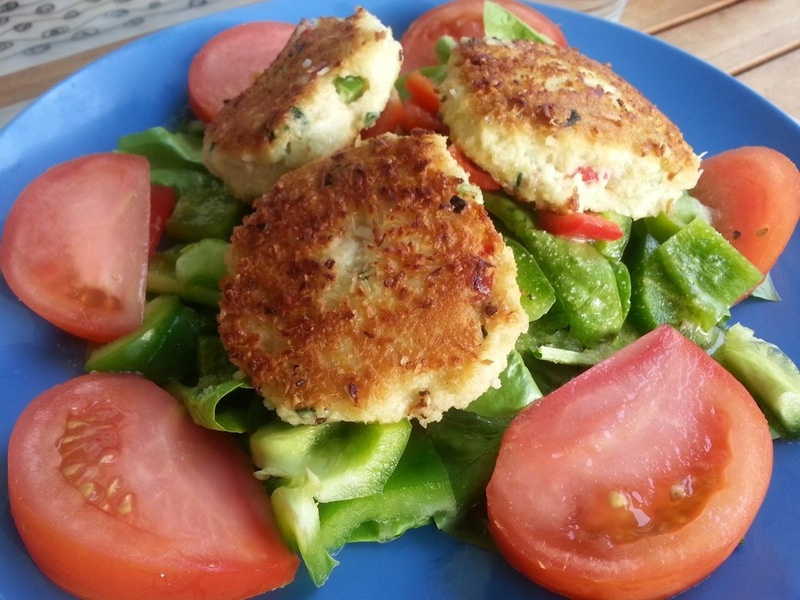 These crab cakes can be served over salad as per the recipe, on their own as an appetizer (make them mini! ), or even on a sandwich! There are many substitutions that can be made as well. Not here for paleo? Substitute bread crumbs for the almond meal. 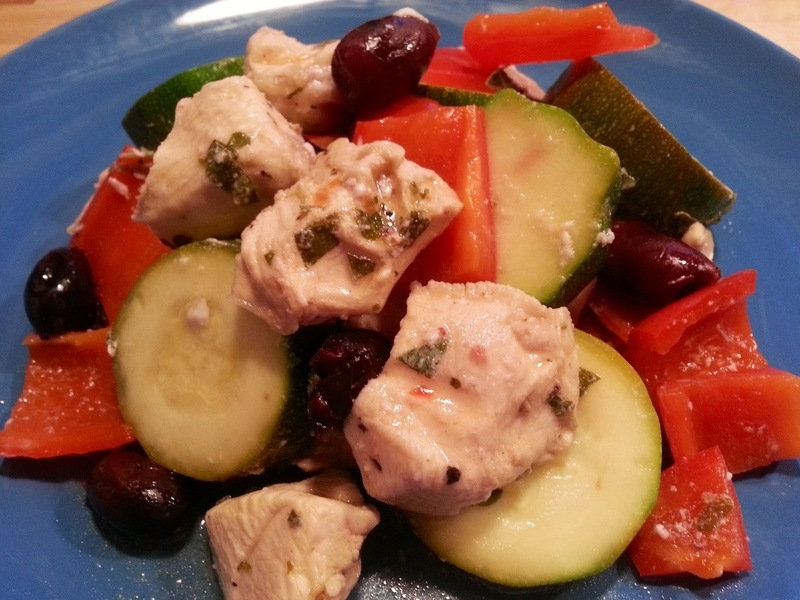 Mayo can be any mayo of your choice – paleo, low fat, or good old Helmans! Don’t have scallions? Throw in chives or leeks. Not a fan of coconut? Skip it and replace with either almond flour or breadcrumbs. 1. Whisk together dressing ingredients in a small measuring cup and set aside. 2. Create two plates with a mound of salad ingredients and refrigerate to chill until ready to serve. 3. In a medium mixing bowl, fold together all crab cake ingredients EXCEPT coconut flakes (hands work best). 4. Form 2 inch patties out of the crab cake mixture and place on a plate or cookie sheet. Sprinkle coconut flakes on both sides of each patty. 5. Heat a large non-stick frying pan over medium high heat, and drizzle with a small amount of olive oil. Sauté cakes until brown on both sides (about 3 minutes per side). School’s out for summer! This teacher is probably just as happy as her students to have the extra time on her hands… Not for the same reasons though. I am looking forward to putting the finishing touches on our wedding, getting into better shape (double sessions of bootcamp yesterday followed by a morning WOD today…what?!? ), and reporting culinary creations to you! With the extra time, I can make a fun lunch! Even better? 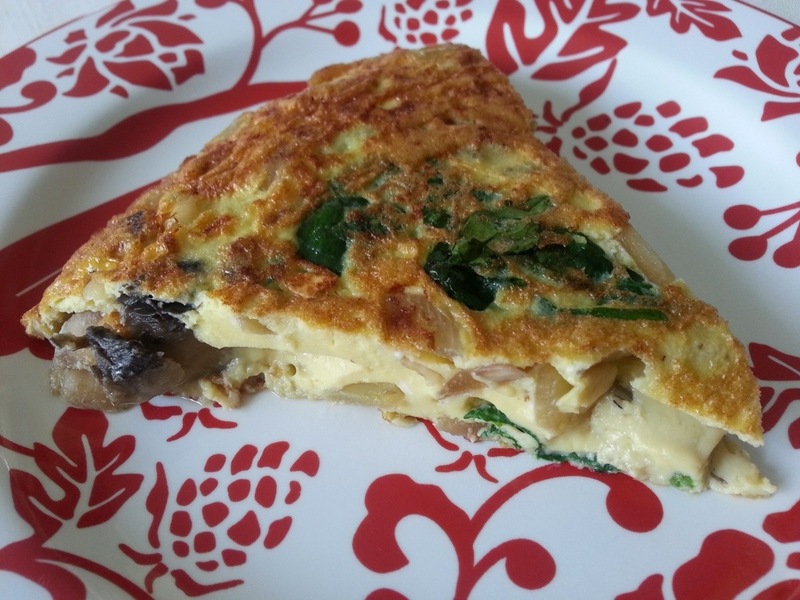 Leftovers are great to reheat on low in the microwave for snacks or other meals during the week! 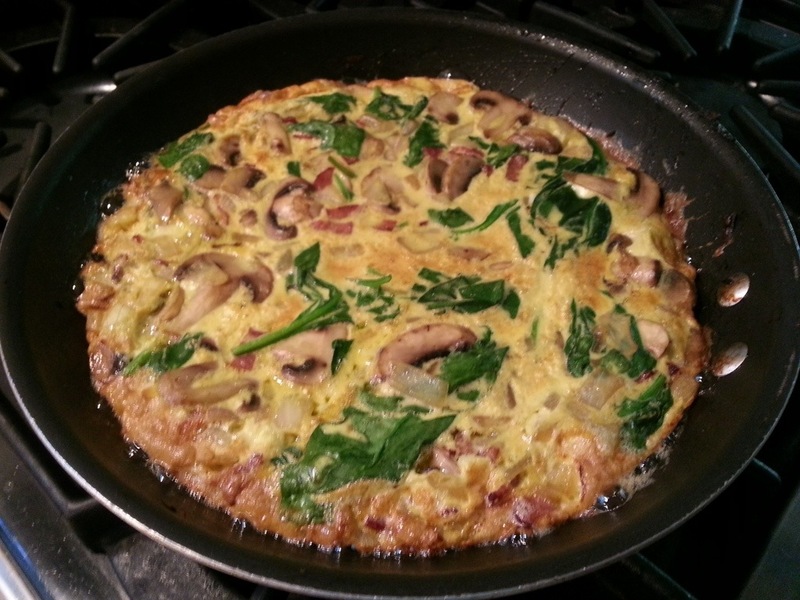 I am craving protein after the extreme workouts over the past 24 hours, so this frittata will do the trick! 2. In a 12 inch non stick frying pan, cook the bacon until crispy, remove from pan, and set aside. 3. In the same pan, add 1 tsp. olive oil and heat over medium high heat. Add onions and sauté while stirring occasionally until transparent. Add mushrooms and cook for another 5 minutes. 4. Lower heat to medium and stir in spinach to the hot mixture and allow to wilt – about 2 minutes. 5. While the spinach is wilting, in a large bowl, whisk together eggs with black pepper. 6. Scoop the contents of the pan into the egg bowl and stir together, then pour back into the frying pan. 7. Cook for about 4 minutes over medium high until the egg sets on the bottom. 8. Place the pan in the broiler for 4 minutes until the top begins to brown. 9. Remove from pan and cut big slices to enjoy! I started the Advocare 24 Day Challenge again today in preparation for our wedding that is very rapidly approaching. I started this blog because recipes were so hard to find while on the challenge, so expect a lot of postings in the near future. As I have said before, I am a beet freak. Well, our garden beets are ready! This will be our first time tasting our garden creation! My fiancé and his kids went strawberry picking last weekend, which has led to a surplus of strawberries around here, so why not turn the, into a delicious dressing? 2. In a mixing bowl, stir together beets, 1 Tbsp. olive oil, and salt and pepper to taste. Grill for 20 minutes, turning halfway through. 3. While the beets are cooking, drizzle 1Tbsp. olive oil, 1 Tbsp. white balsamic vinegar, and salt and pepper over the chicken breasts. Grill for about 5 minutes per side until done. 5. 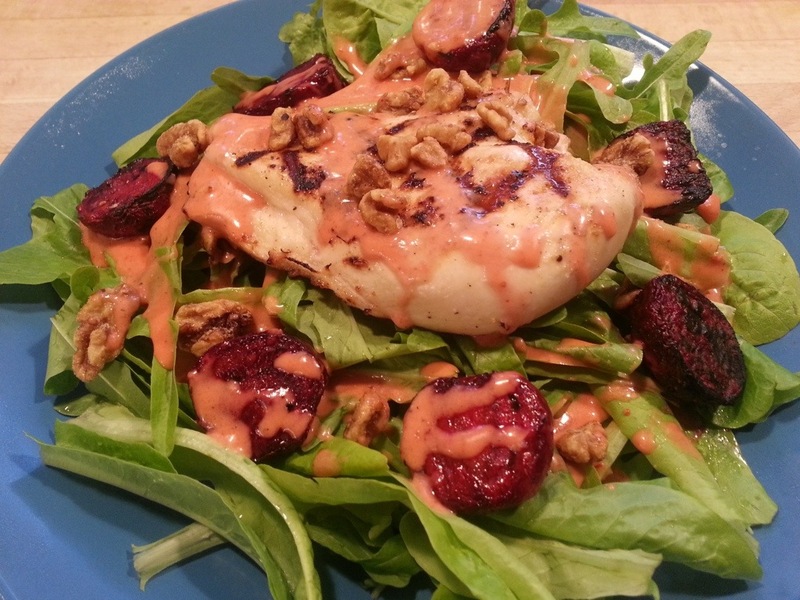 Top a large pile of lettuce with chicken, beets, and walnuts, and drizzle vinaigrette on top. Broccoli rabe is a favorite of ours. 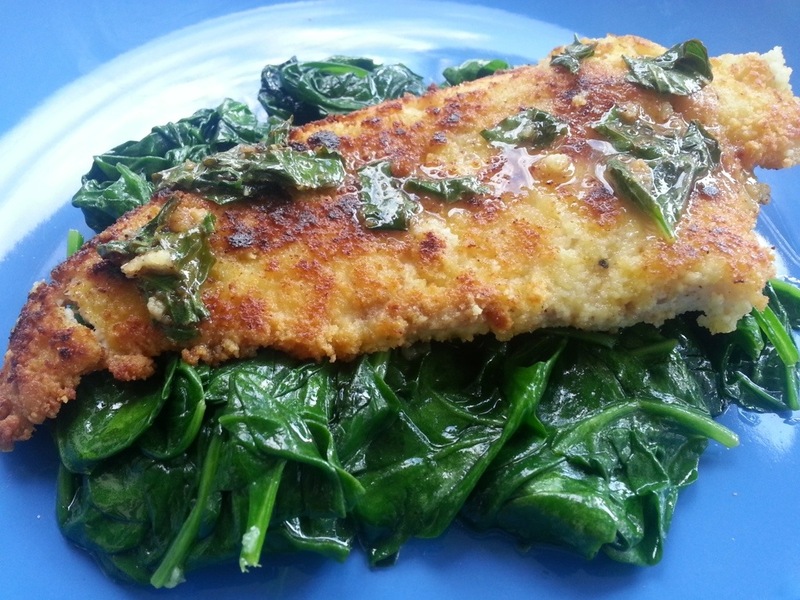 While I love getting creative with new recipes, broccoli rabe isn’t one that I play around with! Lots of garlic and the heat of red pepper flakes is in my opinion the only way to go. Top it with grilled sausage of your choice, and you have a simple, delicious, and paleo meal! Alternate serving options include stirring in pasta (yum, I miss the days of pasta!) or doubling up the broccoli rabe to two bunches if you are extra hungry (it does cook down quite a bit). 1. Preheat grill to medium high heat, and grill sausage until done. 2. While the sausage is grilling, in a large pot, heat olive oil over medium high heat and sauté garlic until fragrant. 3. Add broccoli rabe to pot and cook for 5 minutes while stirring frequently. This will cook the rabe aldente, you may choose to sauté longer if you wish. 4. Stir in red pepper flakes, salt, and pepper. 5. 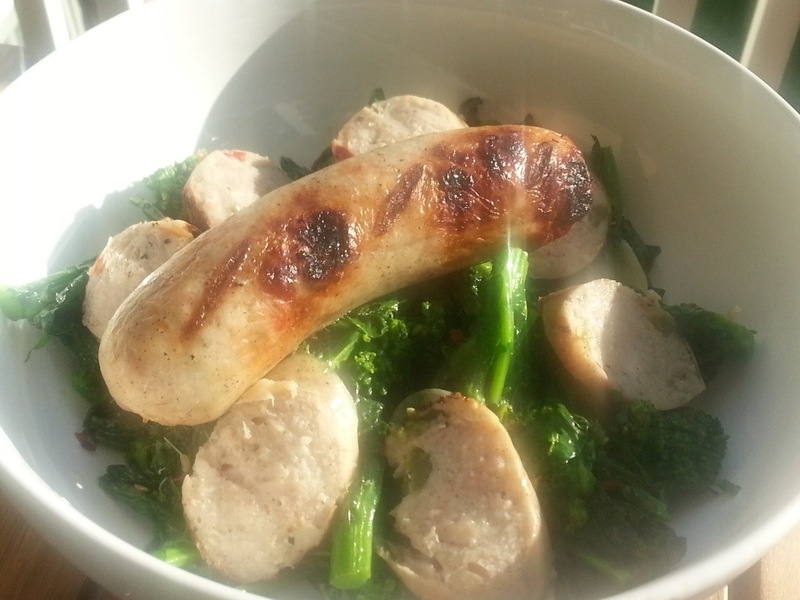 Plate a large pile of broccoli rabe and then top with sausage. 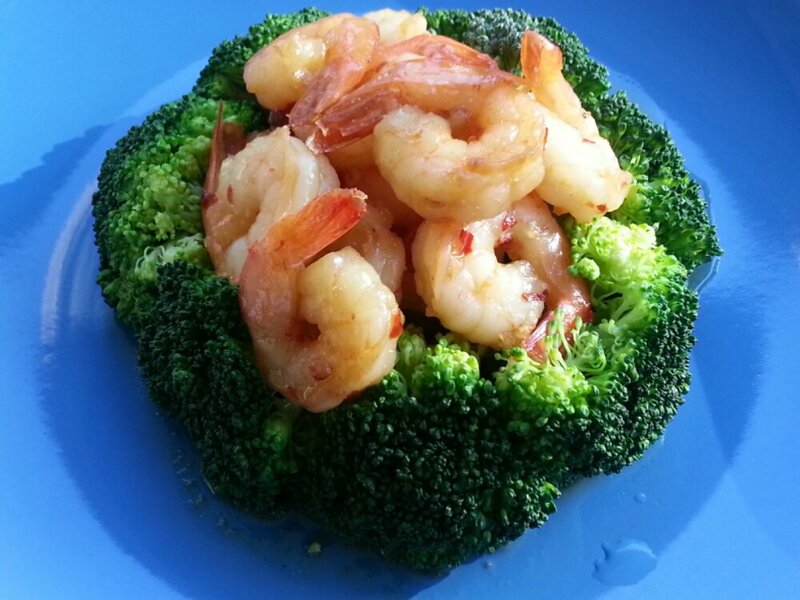 I love the combination of a sweet morsel of shrimp with the heat of red pepper flakes! 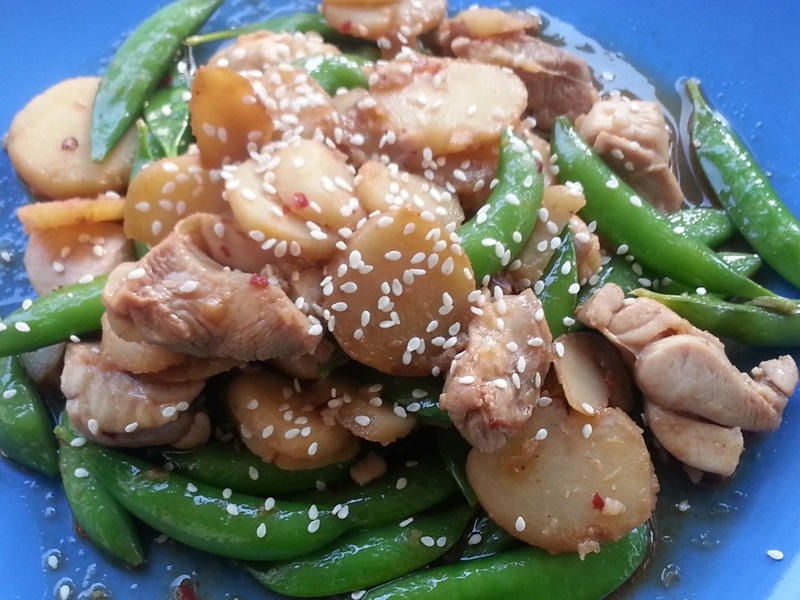 This meal is so easy, and can be prepared in advance and cooked in 10 minutes! This is perfect timing for getting home from a hard workout and getting vital nutrients into your body! 1. 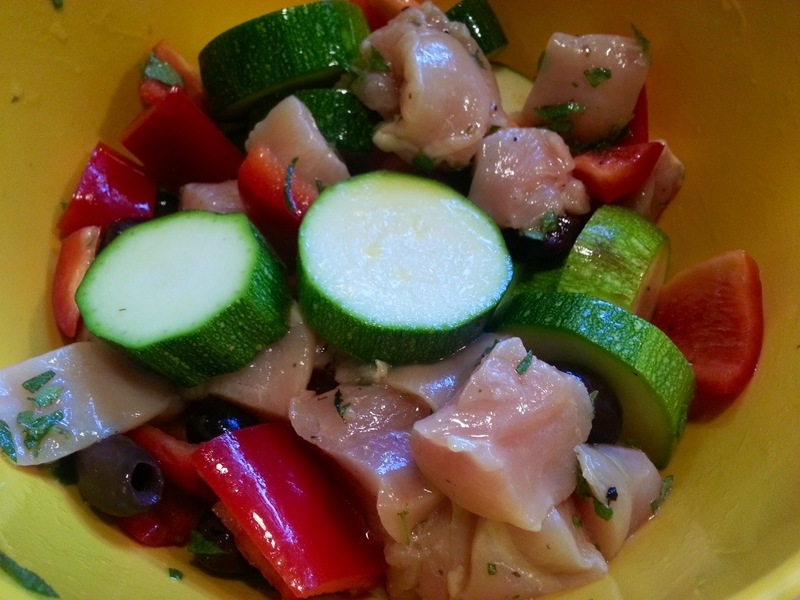 At least 2 hours prior to cooking, whisk together olive oil, brown sugar, red pepper flakes, and garlic in a small bowl. Pour into a ziplock bag with the shrimp and refrigerate until ready to cook. 2. Steam broccoli according to your taste. 3. Heat a large skillet over medium-high heat. Dump entire contents of bag into the skillet and cook shrimp for about 3 minutes per side until opaque and pink. 4. In the last minute of cooking, stir in steamed broccoli to coat and warm up. It is a busy night, so I am resolving it with a quick fix: pre-made mahi mahi burgers from Trader Joe’s. No, they are not real paleo. They have trace amounts of rice flour. Luckily for me, I have adopted what I like to call a “modified paleo lifestyle” which allows me to overlook such things. These mahi mahi burgers can be found in the frozen section at Trader Joe’s. Don’t have a store near you? Feel free to substitute with any pre-made fish patty or burger. Even with a hectic night ahead, I am able to have everything ready to go ahead of time and then just slap the burgers on the grill and assemble the salad last minute. 1. Whisk together dressing ingredients and put to the side. 2. Grill mahi mahi burgers according to packaging. 3. While the burgers are cooking, pile lettuce, red peppers, and corn on two plates. 4. 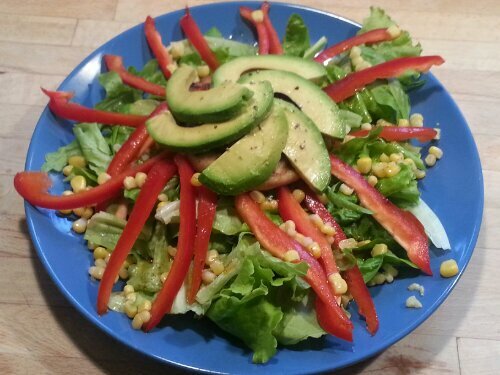 Top salad with burger, avocado, and a spoonful if salsa and then drizzle with dressing.